As a school we have decided to evaluate Moodle for a VLE for our school. The main reasons we have done this is because of the course builder with built in quizs and SCORM builders. I have to say they are very well built. They are not page viewers like some companies make for their SharePoint webparts but these are written to look at the Moodle database and give you the information presented in a proper ASP webpart. I’m very pleased to see this happen. What caught my eye straight away and credit to the writer of this is the office presence by the names of the course. One of the web parts is the moodle courses which lists all the available course and as you can see it (screen shot below) has the teachers name and then the office presence. I think it is a shame that in Moodle itself doesn’t show this – because if the pupil was accessing the course, doing some work and they had an issue they could see the teacher straight away and ask them any questions. In this post I’m going to mainly list the webparts with a screen shot – I’ve already started on another post to do with the install of them and I will also do a post on how to publish Moodle, SharePoint and the Moodle WebApps from the same URL through ISA. Again this is more powerful in SharePoint than in Moodle as you can see their Office Presence as well. I do like this web part. 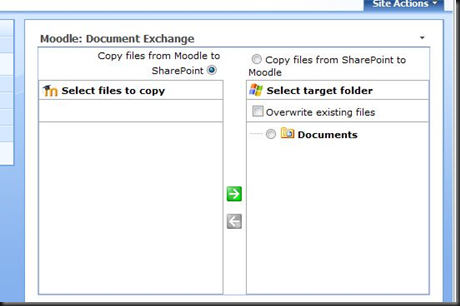 On the left you have your Moodle course, on the right hand side you have your SharePoint Document library. This web part will allow you to transfer documents between both products. There are some other webparts but they are very similar, depending on the user. In the next few weeks I’ll do a post on how to install moodle and the webparts on a Windows System with SQL Server and also another post which I have been asked to do on how to publish it all through ISA on a single URL. I’ve not tried this is 1.9. I need to set this up again in my dev environment and will let you know how I get on. Thank you for the valuable info. 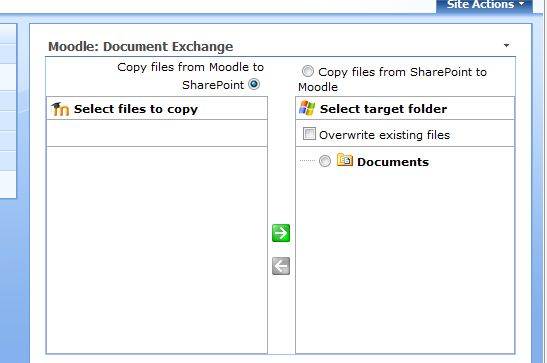 Can you please send me the link on how to integrate Moodle with Sharepoint2007. Is there an option for Moodle 2.X and Sharepoint 2013?